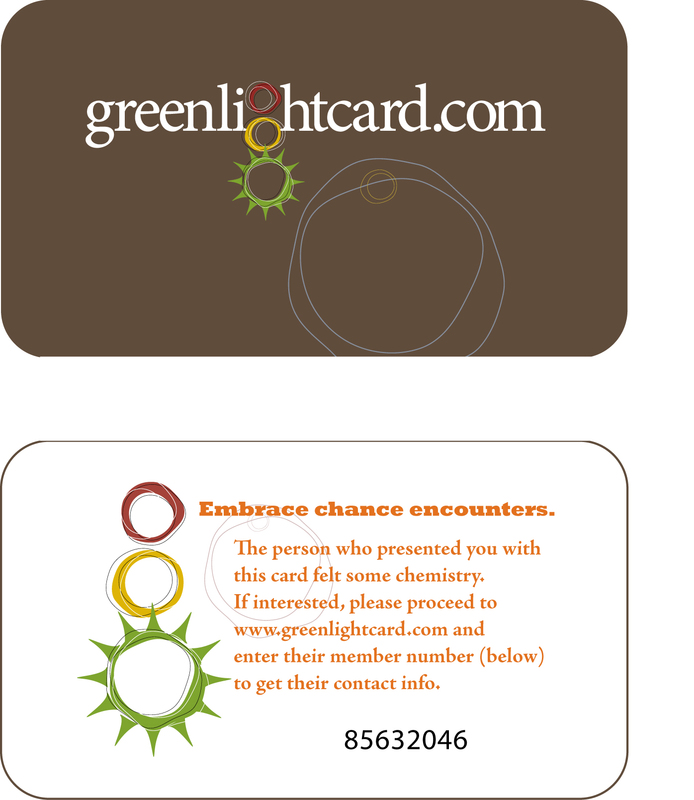 As you know if you’ve been reading this blog or checking out GreenlightCard.com, we like the idea of embracing chance encounters. You see, we’ve found that more often than not, the most interesting possibilities arise when you aren’t out looking for them. They just appear. Like when you’ve just finished a workout and are all sweaty and high on endorphins. Like when you’re having fun with your child or grandchild at a park, when flirting is the last thing on your mind. Like when you’re leading a group at work, and you know just what you’re doing and are comfortably in command. When you are being you, people around you notice. They are drawn to you, not your age, height, weight and astrological sign, but your intuitiveness, your sense of fun, your intelligence, your drive. It might not even be the things you like best about yourself that someone else finds attractive—he or she might be drawn to your endearing clumsiness or your inability to say no to the child who wants one more push on the swing. So what should you do this weekend? Make a vow to yourself right now that you won’t try so hard or worry so much about meeting the perfect person. Just be you. Have a great time. And carry your Greenlight Cards, so that you’re ready when it happens. Single Dad Meets Single Mom: Could This Be You? You, a single dad who always feels a little out of place when it comes to the daytime playground scene, is nevertheless at the playground with your son and you see a woman there with her two kids. You’re just a little bit smitten by the way she gets on all fours to chase her kids around the slide, ignoring all the other moms who sit on a bench watching their kids from a distance. You watch as she and the kids plop themselves at a picnic table, sweaty and tired. You tell your son it’s break time and take a nearby table. You smile. She smiles. You and your son share some water and cookies. Another glance, long enough to check for a wedding ring. There isn’t one. Another smile. You want to start up a conversation but feel more than a little awkward, especially with all the kids around, and the other moms on their benches. Just as you work up the courage to ask her how old her kids are, she gets up to chase one of them and then the moment is over. Your son is ready to leave. He’s cranky and by the time you get home, you’re a little cranky yourself. You go back to the playground a few days later, same time of day. She isn’t there. But the next time she is–and you’re ready. You’ve thought about this moment, about how to start the conversation, and with practically no effort at all, it starts. The kids play and you manage to find out that she’s not married. You manage to mention that you aren’t either. This, my friend, is one of many perfect opportunities to use a Greenlight Card.